Whole grains offer a “complete package” of health benefits, unlike refined grains, which are stripped of valuable nutrients in the refining process. Choose whole grains instead of refined grains. All whole grain kernels contain three parts: the bran, germ, and endosperm. Each section houses health-promoting nutrients. The bran is the fiber-rich outer layer that supplies B vitamins, iron, copper, zinc, magnesium, antioxidants, and phytochemicals. Phytochemicals are natural chemical compounds in plants that have been researched for their role in disease prevention. The germ is the core of the seed where growth occurs; it is rich in healthy fats, vitamin E, B vitamins, phytochemicals, and antioxidants. 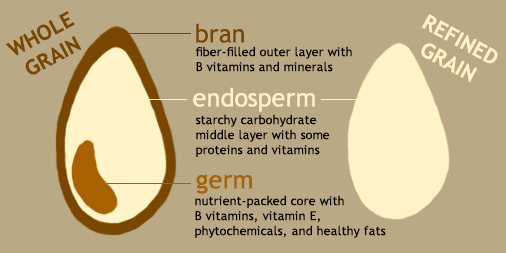 The endosperm is the interior layer that holds carbohydrates, protein, and small amounts of some B vitamins and minerals. Bran and fiber slow the breakdown of starch into glucose—thus maintaining a steady blood sugar rather than causing sharp spikes. Phytochemicals and essential minerals such as magnesium, selenium and copper found in whole grains may protect against some cancers. The invention of industrialized roller mills in the late 19th century changed the way we process grains. Milling strips away the bran and germ and leaves only the soft, easy-to-digest endosperm. Without the fibrous bran, the grain is easier to chew. The germ is removed because of its fat content, which can limit the shelf life of processed wheat products. The resulting highly processed grains are much lower in nutritional quality. Refining wheat creates fluffy flour that makes light, airy breads and pastries, but the process strips away more than half of wheat’s B vitamins, 90 percent of the vitamin E, and virtually all of the fiber. Although some nutrients may be added back by fortification, other health-promoting components of whole grains such as phytochemicals cannot be replaced. A growing body of research shows that choosing whole grains and other less-processed, higher-quality sources of carbohydrates, and cutting back on refined grains, improves health in many ways. For a closer look at carbohydrates, check out our Carbohydrate Guide. Be careful when choosing foods labeled as whole grains: “Whole grain” doesn’t always mean healthy. The study assessed five USDA criteria that identify whole grains in a food product: 1) any whole grain as the first ingredient, 2) any whole grain as the first ingredient, and added sugars not being one of the first three ingredients in the ingredient list, 3) the word “whole” before any grain ingredient, 4) a carbohydrate-to-fiber ratio of less than 10:1, and 5) the industry-sponsored Whole Grain Stamp. The Whole Grain Stamp is a widely used marker on food products. The stamp, while designed to steer consumers towards healthy whole grains, identified products with more fiber and less sodium and trans fat but that were higher in sugar and calories than whole grain foods without the stamp. The other three USDA criteria had mixed results in identifying healthier whole grain products, but (criterion 4) the carbohydrate-to-fiber ratio of less than 10:1 proved to be the most effective measure of healthfulness. However, it is unclear whether this ratio is more predictive of chronic disease risk than other measures of carbohydrate quality—such as the amount/type of fiber or overall dietary glycemic index/load. Foods that met this criterion were higher in fiber and less likely to contain trans fats, sodium, and sugar. Because calculating the carbohydrate-to-fiber ratio may be difficult and not readily available for a consumer reading a label, the study suggests that labeling guidelines appearing on whole-grain foods should be improved. Consumers should steer towards whole grain foods that are high in fiber and that have few ingredients in addition to whole grain. Moreover, eating whole grains in their whole forms—such as brown rice, barley, oats, corn, and rye—are healthy choices because they pack in the nutritional benefits of whole grains without any additional ingredients. Eating whole instead of refined grains substantially lowers total cholesterol, low-density lipoprotein (LDL, or bad) cholesterol, triglycerides, and insulin levels. Replacing refined grains with whole grains and eating at least 2 servings of whole grains daily may help to reduce type 2 diabetes risk. The fiber, nutrients, and phytochemicals in whole grains may improve insulin sensitivity and glucose metabolism and slow the absorption of food, preventing blood sugar spikes. In contrast, refined grains tend to have a high glycemic index and glycemic load with less fiber and nutrients. In a study of more than 160,000 women whose health and dietary habits were followed for up to 18 years, those who averaged 2 to 3 servings of whole grains a day were 30% less likely to have developed type 2 diabetes than those who rarely ate whole grains. When the researchers combined these results with those of several other large studies, they found that eating an extra 2 servings of whole grains a day decreased the risk of type 2 diabetes by 21%. Some grains contain the naturally-occurring protein, gluten. While gluten can cause side effects in certain individuals, such as those with celiac disease, most people can and have eaten gluten most of their lives—without any adverse reaction. However, negative media attention on wheat and gluten has caused some people to doubt its place in a healthful diet, though there is little published research to support such claims. For further information on gluten and health, see: Gluten: A Benefit or Harm to the Body? Mozaffarian RS, Lee RM, Kennedy MA, Ludwig DS, Mozaffarian D, Gortmaker SL. Identifying whole grain foods: a comparison of different approaches for selecting more healthful whole grain products. Public Health Nutr. 2013;16:2255-64. Wu H, Flint AJ, Qi Q, et al. Association between dietary whole grain intake and risk of mortality: two large prospective studies in US men and women. JAMA Intern Med. 2015;175:373-84. Jacobs DR, Jr., Andersen LF, Blomhoff R. Whole-grain consumption is associated with a reduced risk of noncardiovascular, noncancer death attributed to inflammatory diseases in the Iowa Women’s Health Study. Am J Clin Nutr. 2007;85:1606-14. Zong G, Gao A, Hu FB, Sun Q. Whole Grain Intake and Mortality From All Causes, Cardiovascular Disease, and Cancer: A Meta-Analysis of Prospective Cohort Studies. Circulation. 2016;133:2370-80. Liu S, Stampfer MJ, Hu FB, et al. Whole-grain consumption and risk of coronary heart disease: results from the Nurses’ Health Study. Am J Clin Nutr. 1999;70:412-9. Mellen PB, Walsh TF, Herrington DM. Whole grain intake and cardiovascular disease: a meta-analysis. Nutr Metab Cardiovasc Dis. 2008;18:283-90. Aune D, Norat T, Romundstad P, Vatten LJ. Whole grain and refined grain consumption and the risk of type 2 diabetes: a systematic review and dose-response meta-analysis of cohort studies. Eur J Epidemiol. 2013;28:845-58. Sun Q, Spiegelman D, van Dam RM, et al. White rice, brown rice, and risk of type 2 diabetes in US men and women. Arch Intern Med. 2010;170:961-9. Parker ED, Liu S, Van Horn L, et al. The association of whole grain consumption with incident type 2 diabetes: the Women’s Health Initiative Observational Study. Ann Epidemiol. 2013;23:321-7. Aune D, Keum N, Giovannucci E, et al. Whole grain consumption and risk of cardiovascular disease, cancer, and all cause and cause specific mortality: systematic review and dose-response meta-analysis of prospective studies. BMJ. 2016;353:i2716. Jacobs DR, Jr., Marquart L, Slavin J, Kushi LH. Whole-grain intake and cancer: an expanded review and meta-analysis. Nutr Cancer. 1998;30:85-96. Schatzkin A, Mouw T, Park Y, et al. Dietary fiber and whole-grain consumption in relation to colorectal cancer in the NIH-AARP Diet and Health Study. Am J Clin Nutr. 2007;85:1353-60. Strayer L, Jacobs DR, Jr., Schairer C, Schatzkin A, Flood A. Dietary carbohydrate, glycemic index, and glycemic load and the risk of colorectal cancer in the BCDDP cohort. Cancer Causes Control. 2007;18:853-63. Strate LL, Keeley BR, Cao Y, Wu K, Giovannucci EL, Chan AT. Western Dietary Pattern Increases, and Prudent Dietary Pattern Decreases, Risk of Incident Diverticulitis in a Prospective Cohort Study. Gastroenterology. 2017;152:1023-30 e2. Ananthakrishnan AN, Khalili H, Konijeti GG, et al. A prospective study of long-term intake of dietary fiber and risk of Crohn’s disease and ulcerative colitis. Gastroenterology. 2013;145:970-7.